Many factors—not just parts and labor—contribute to the ever-rising cost of bikes. Expensive is a relative term: What may be a lot of money for a college student may not be so for a dentist. But for the sake of argument we’ll consider an expensive bike to mean enough to make you think twice about buying one. Bike prices are dictated in part by market economics. An item priced too high will sit in inventory; an item priced too low won’t recoup production costs and overhead. Determining price point is some trial and error and some market research. Most bike brands have established price ranges; although new bikes may change from year to year, the price points don’t vary too much. The aerodynamic testing facility Specialized built—the “Win Tunnel”—and all the hours Zipp engineers sunk into CFD modeling of its new sawtooth-shaped wheels must be recouped. Add in the cost of staff time, materials for tested iterations and to manufacturer each test item and you can understand why R&D can get expensive and must be covered by the ultimate sale of the product. One of the biggest factors in the cost of bicycles is materials. Carbon fiber comes in various forms and grades. The higher the quality of carbon, the greater the cost of sourcing from manufacturers. This includes increased care required during refrigerated transit and cold storage, and the greater precision and attention to detail needed when fabricating new bikes. If a bike manufacturer is also fabricating its own carbon, this cost must be recouped in the sale price of a bike. Higher quality materials require more care during the manufacturing process. “Clean” welds on an aluminum bike frame bicycle require more attention—even if a robot is doing the welding, a human oversees the process. Aerodynamic frame shapes constructed of carbon fiber sheets demand consistent, precision assembly in very controlled processes with very small tolerances. One of the factors that sets the big name bike brands apart from department-store and generic bike brands is quality control. Engineers from the well-known brands routinely visit their respective manufacturing facilities to check up on every aspect of the bike manufacturing process. Reviewing some of the online groups in which bicycle mechanics participate, one of the most-discussed topics is the lack of quality control seen in the materials used and assembly of generic and counterfeit carbon fiber bikes and parts. Every deviation from a standard production model adds cost. While it is nice to have the color you want or the specific parts group, a change to the stem length, for instance, requires a break from the normal assembly process, thus an increase in cost. 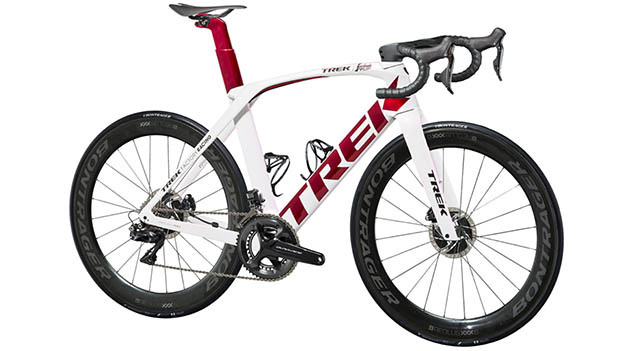 If you want a Trek Madone, you’ll pay $12,300 for a stock bike; the ProjectOne version with some customization will cost nearly $2,400 more. What Is a “Good Value” for an Expensive Bike? There is no ceiling on the price of new bikes, and prices will continue to climb upwards. A bike that is a good value is one that excited you, one you can afford and one that meets your riding needs. An excellent way to ensure you’re getting a good value when buying a new bike is to buy from either a local bike shop or a bicycle-specific manufacturer. Avoid buying a bike at a “big box” store. Consider previous years’ bikes; often but not always the current model year bikes have cosmetic updates from the previous year and may be discounted for a quick sale.